The Atrix 3 has it all... but is it real? 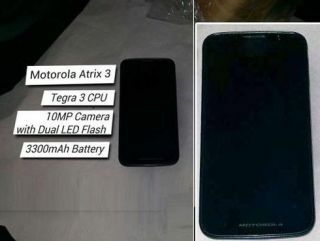 The Motorola Atrix 3 may have been revealed in spy-shots which have turned up online along with some impressive specifications. The images and details leaked on Chinese website Tianjin suggest the Atrix 3 will follow on from the dockable Atrix and Atrix 2 apparently boasting a powerful quad-core Tegra 3 processor and 2GB RAM. The extra power suggests the Atrix 3 will be compatible with Motorola's LapDock, allowing the phone to function as a basic laptop. This would put it in quad-core competition with the HTC One X and Huawei Ascend D1 Q, as well as the Asus Padfone in the phone-computer crossover market. The design of the Atrix 3 follows the style of its predecessors however it has lost the touch buttons below the screen. The lack of physical buttons leads us to assume that the Atrix 3 will run the latest version of Android Ice Cream Sandwich, which does away with the need for buttons. The leak also says the Atrix 3 will pack a 4.3-inch 720p HD screen, 10MP camera with dual LED flash and a huge 3300mAh battery. There's not long until MWC 2012 and the Atrix 3 is very much still in the rumour mill stage, but we would love to see it announced in Barcelona.